A WELL-PLACED banana saved Louis Twomey from lasting damage after crashing out of Saturday’s Travers Engineering Annaclone GP in County Down. Twomey was brought down close to the finish of the A4 contest, sustaining minor injuries thanks to the death of the unused banana in his centre pocket. He got up and finished the race. He said: “I was quite lucky really and came away with nothing more than a small bit of very minor road rash on one side of my arse, a small bruise on my lower back, and the profile of a chainring scraped into the other side of my arse. Racing secretary Richie Gallagher and club champion John McGettigan had mixed fortunes in the A1-A3 race, McGettigan coming out on top of his team-mate despite a mechanical. Gallagher said: “Good racing today on the tough and sometimes icey roads around Annaclone. John was flying all day but had a mechanical around the halfway mark. 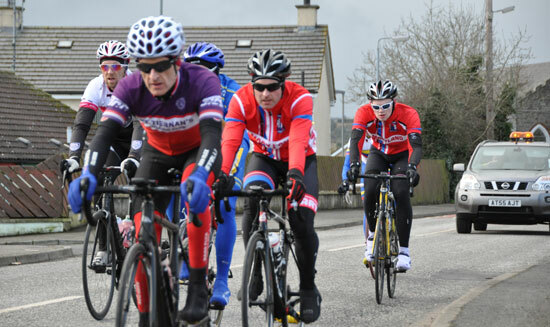 He managed to catch onto the A1/A2 break of four riders, including Irish international rider Mark Downey, and rode strongly with them to overcome a 50 second deficit to the A3 bunch within one lap. The race was won by Newry Wheelers rider Andrew By, Ballymoney CC’s Niall O’Hagan finishing second and James Curry, representing hosts Banbridge CC, completing the podium. The A4 race went to CRC’s Christopher McGlinchey. No Replies to "Banana cushions Twomey fall in Annaclone crash"